Last year I joined the vinyl resurgence movement and bought a turntable. Like many of my generation, I at one time, had a pretty substantial collection of great albums that I thoroughly enjoyed. But with the dawning of the digital age, the space intensive records were slowly replaced and they went the way of the eight track. So instead of just buying back all of those old favorites, which can get pricey if you’re not careful, I began looking at flea markets, garage sales and eBay. To make it interesting, I set my budget to no more than five dollars on a single album and I have found that the search has been as rewarding as the find itself. It’s like those old days of discovery, searching the cut-out bins at Tower Records. And with that, my collection grows, one LP at a time. 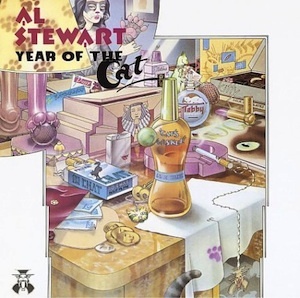 On a recent flea market stop, I came across a near perfect copy of Al Stewart’s 1976 classic The Year of the Cat. It’s not a record I ever owned but something about it caught my attention. I’d like to say it was the cover art but I’m probably the least likely guy to be attracted to cats. I remember hearing the title track often on the Dr. Don Rose show on the Bay Area’s KFRC 610 AM. I had no idea what any of the lyrics meant but I always thought there was something very cool about it in a jazzy pop tune kind of way. The rest of the album was more of an unknown to me, but I figured for one dollar, I couldn’t go wrong. The great thing about albums is the ceremony that accompanies the first spin. It forces you to sit back and actually listen. As the needle drops and I hear that beautiful surface noise, I’m immediately swept into the wonderfully warm sound that ONLY vinyl can offer. And then there’s the thorough study of the cover, the artwork, the lyrics and the liner notes – essential to the whole experience. Who even writes lyrics like that today? I found myself wanting to listen to the entire record again. When was the last time that happened to you? As it turns out, I am not the only one. This has become the ‘go- to’ record in our house because it gets everyone’s attention. They stop and take notice. There’s something about it that resonates and makes you want to hear it again. It got me thinking. This would make a perfect feature for boomitude and maybe Al Stewart would be willing to tell us his story.